September already! This month we want to share some news about the hiring process for the artistic leader of Indigenous Theatre at the NAC. Following a day-long session held in Ottawa at the NAC on August 23, 2016, the Advisory Committee comprised of Reneltta Arluk, Dave Jenniss, Annie Smith St. Georges, Jesse Wabegijig, Kenneth T. Williams, Elder support and Métis Elder Robert Smith St. Georges, Brittany Ryan, and Sarah Garton Stanley, a list of recommendations /thoughts were put together that will eventually be put forward to the NAC. As part of the committee’s process, these draft ideas were sent to the larger community for feedback. We have received great feedback and would like to express our gratitude for the response. It is anticipated that the recommendations put forward by the Committee to the NAC will be fully considered. On Thursday, September 21st, 2016 the recommendations from the Advisory Committee that will incorporate feedback from the community will be brought forward to the NAC for consideration. The NAC will then begin posting for the job and launching more fully into the hiring process. 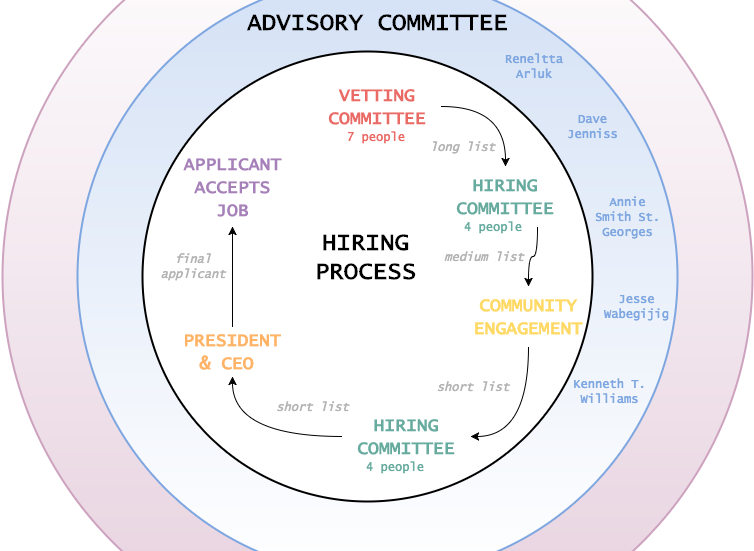 In October the Advisory Committee will turn their attention to supporting and enabling a healthy, transparent process through to selecting the hiring. The Advisory Committee will endeavour to stay in contact with interested community members and to share responses and concerns arising out of the process with the NAC. The Committee will also work to clarify communications coming out of the NAC whenever required. It is anticipated that the job posting will go out in late October and the first leadership of Indigenous Theatre will be hired by the end of June 2017. As the list of recommendations is being finalized, we would like to share with you the proposal being put forward for the hiring process. This diagram clearly depicts step-by-step actions that the various committees will undertake to select the final leadership of Indigenous Theatre. The Advisory Committee comprised of Reneltta Arluk, Dave Jenniss, Annie Smith St. Georges, Jesse Wabegijig, and Kenneth T. Williams will continue to advise and liaise throughout the hiring process. In other news, we want to share that Suzanne Keeptwo offered a workshop to NAC staff on September 1st. It was really well attended. Suzanne offered the workshop in English and French and kept participants fully engaged from 10-2:30. NAC employees have been talking lots about Suzanne’s class and the issues it raised, and the information she shared. The NAC is undertaking several pilots towards determining their longer range plans for Indigenous education. Suzanne’s workshop was a great start. From all of us to you, thank-you for your time and interest and please be in touch.